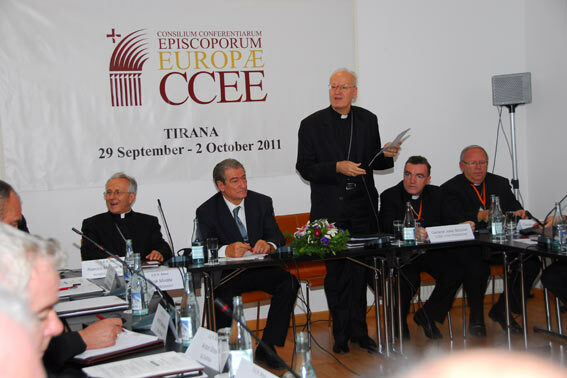 “New Evangelization of Europe” was at the center of the work of the Plenary Assembly of the Presidents of Europe’s Bishops’ Conferences (CCEE - Consilium Conferentiarum Episcoporum Europae), which took place in Albania, in Tirana, from 29 September to 2 October 2011. His Beatitude Sviatoslav (Shevchuk) –Head of the UGCC and Bishop Bohdan (Dzyurakh) – Secretary of the Synod of Bishops of the UGCC took part in the Plenary Assembly on behalf of the Synod of Bishops of the UGCC. “New Evangelization of Europe” was at the center of the work of the Plenary Assembly of the Presidents of Europe’s Bishops’ Conferences (CCEE - Consilium Conferentiarum Episcoporum Europae), which took place in Albania, in Tirana, from 29 September to 2 October 2011. First, Jean Luc Moens, former coordinator of the experience of city missions in European capitals, summarized the responses of a questionnaire received by the Bishops’ Conferences in these weeks. After that, Archbishop Rino Fisichella, President of the Vatican dicastery for Promoting New Evangelization, hold a presentation on the main theme “New Evangelization of Europe”. After presenting European social, political and cultural context in which the Church is called to evangelize, the main speaker proposed a few ways how to do that in modern circumstances. In his opinion, new evangelization should enter a new cultural context of Europe, and the Church leaders should reflect upon their ability to transmit the values and truths which will be of help to modern people and societies in Europe. His Beatitude Sviatoslav (Shevchuk) –Head of the UGCC and Bishop Bohdan (Dzyurakh) – Secretary of the Synod of Bishops of the UGCC took part in the Plenary Assembly on behalf of the Synod of Bishops of the UGCC.